When you think of rifles and machine guns they shoot projectiles through the air, propelled by a charge of powder contained inside a brass shell case. The projectile and the case of propellant, come as a package called a bullet. Military guns shoot their projectiles at great velocities over long distances, small bore weapons of calibres less than 0.23inch diameter shoot their projectiles over shorter distances. Air gun projectiles are of similar material but the force used to propel the projectile (a pellet) is compressed air or compressed carbon dioxide (CO2). Today’s force is usually compressed air contained in a cylinder attached to the weapon. Cylinder capacities vary but usually start at 200 bar, some use 300 bar pressures, only a small portion of this is used for each firing (air pistols can fire up to 100 pellets for each fill). Air guns used in field sports or for control of vermin etc, are usually fitted with a telescope. For Target shooting only “iron sights” can be used. Iron sights are fixed sights on the air pistol or air rifle which can be adjusted, but have no lenses. Pellets used for field sports and vermin control typically use rounded or pointed heads; pellets for target shooting generally use a flatter head as this makes for a cleaner shot hole in the paper, which is easier to score. Our club enters into Somerset County competitions and National competitions run by the National Small Bore Rifle Association (NSRA). Due to the power limitations of air guns we shoot at distances of 10m and 20 yards. 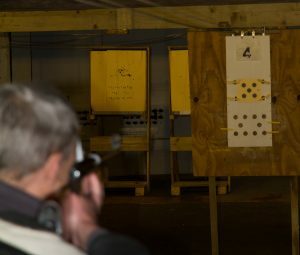 Airgun competitions are shot using a single diagram on a card suspended from a frame on a motorised track so that targets can be retrieved without the shooter having to step in front of the shooting line. At 10m we stand and can use air pistols or air rifles. Both have a setup procedure to hope for a high score, this setup takes time and a lot of practice is required to obtain a decent score. Coaching is provided to help shooters understand both the technical setup and how posture and breathing affects grouping the shots, and therefore the score! Also at 10m we can shoot 3 positions ie prone, kneeling and standing although at present we do not have all the equipment at the correct distance to fully promote the air gun prone position. We also shoot air pistol at 20 yards in competition. None of it is easy! In competition we use 0.177 (4.5mm) pellets. In some 20 yards shoots we can use 0.22 (5.5mm) pellets. For air pistol you only need an air pistol; no specialist clothing. For air rifle, you need an air rifle – which the club has for loan until you want to obtain your own. Specialist clothing (minimum Jacket) is of great advantage in 10m standing air rifle, the club has some jackets for your use. Small bore weapons (of the bullet variety) in this country need licencing. Currently no such licence is needed for air guns providing the power of the air gun does not exceed the existing power limits set out by the government. Rules apply in all competitions which will be explained during the training period.